You may know her as Katie Molnar, others may know her as “Little Lugene.” And as with any good nickname, there is a story. During the summer of 2014 Katie worked very closely with Lugene Young, the manager of Health Services in the department of Student Services on the Agricultural Campus. Here she discovered her passion for learning and promoting health and wellness. 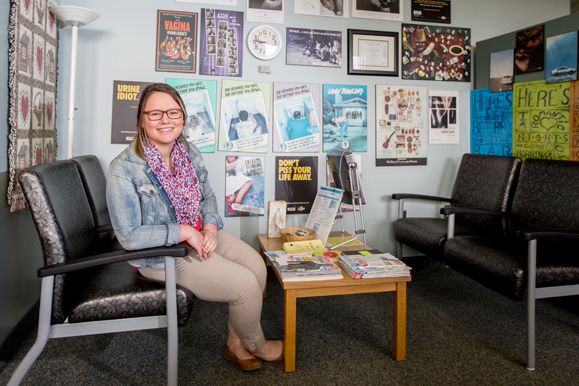 “Lugene became a mentor to me and as we started working together more, the Student Services team noticed that we had very similar personalities and they began to call me ‘Little Lugene’,” explained Katie. Learning gives Katie a feeling of self-achievement. “I feel the more I learn, the more that I have to share and help the people around me. Knowledge is power,” she said. Katie’s passion and dedication to promoting health and wellness led to her receiving the Health Education Award at this year’s IMPACT awards. The Health Education Award is given to a student leader who through the creative use of resources, has enhanced the quality of student life and development on this campus. Katie has been actively involved with RESPECT on the Agricultural Campus. RESPECT is an acronym which stands for Real Energy Supporting Peer Education on Current Topics. The RESPECT team this year consisted of two students, Abbey Martin and Katie. They worked collaboratively with Health Services and Student Services to promote and educate their peers to adopt health enhancing behaviors and attitudes to create a healthy campus environment. “We provide health education outreach on topics such as sexual health, responsible drinking, stress management, healthy eating, active living and positive body image to name a few,” Katie explained. Her time here at the AC has been a learning experience. Right now Katie is unsure what the future holds. Following Convocation, Katie will be working at a dairy farm throughout the summer however she can definitely see herself returning to school in the near future and eventually pursing work in the health field, whether it be with humans or animals. Her words of wisdom to any future grads? Check out the unique programs available here at the Faculty of Agriculture.